It’s an absolute joy to squeeze into a room with 130 other type-lovers, drink beer, eat cherry tomatoes dipped in yummy tzatziki, laugh and catch up on each other’s week, and then hear from inspiring and talented people that are forging new ground in the industry we love. And then drink a little more beer. That’s exactly what Wednesday night TypeParis Talks look like each week, and it’s an honour to be a part of it. This week (Week 3 already!) 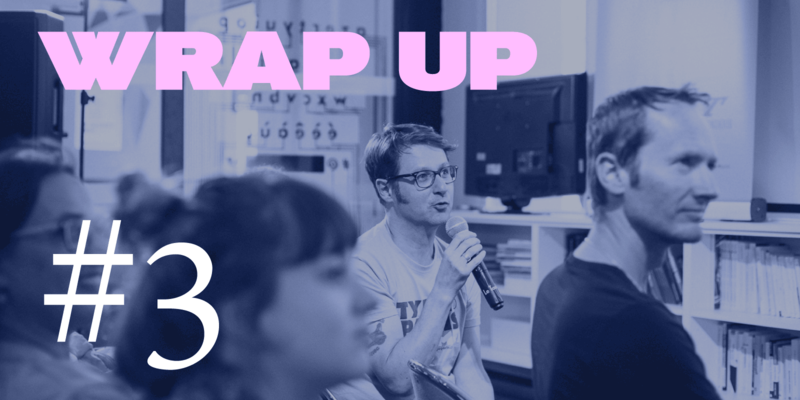 we heard from Helena Ichbiah of design studio Ich&Kar, and Peter Biľak of type foundry Typotheque, magazine Works that Work and ground-breaking font rental service Fontstand. I have been so inspired each week by our guests, and this night was no exception. Helena and her team create designs that are both highly functional and warmly inviting. There’s a sense of fun and humour woven into each project, and Helena’s personal approach to client management is, I’m sure, a huge contributor to their success. It was encouraging to hear her stories, see photos of the clients that they respect so much, and admire her honesty and candour. I must confess, the prospect of hearing Peter speak was set to be a TypeParis highlight for me. I greatly admire his work, and the way his foundry contributes to the industry not only through fantastic typefaces, but fascinating blog posts, case studies, gorgeous specimens and interesting Twitter discourse. Peter was warm and friendly from the very beginning, and the TypeParis attendees were touched by his interest not only in their type projects, but their background and goals for the future. It was through that information that Peter shared valuable feedback on the student’s work, not only through red squiggles on our paper, but insights into the way we think about type, and how we can be better. His talk was, as you’d expect, riveting. He discussed the limits of interpolation, and coming up with creative solutions for when your system ‘breaks’, showed us some beautiful work including the gorgeous Greta, and discussed his upcoming and long-term commission by the Grand Paris Express project started last year with Intégral Ruedi Baur: A new typeface family to be used in many years for the new metro lines 15 and 16. Ich&kar presents "soleil" typeface for silver engraving, for Christofle. So nice fascinating projects at @typeparis #tptalks16 ! Huge thanks to the speakers for sharing with us, to LeTank for hosting us, to the Typofonderie staff for all their hard work setting up and signing everyone in, to Jean François and Véronique for tirelessly organising the event and giving us a reason to be here, to Gilles Poplin for hosting the session, to the livestreamers for their support, and of course to everyone who made it out on the night; we couldn’t do it without you. — Helena Ichbiah + Peter Biľak replays.